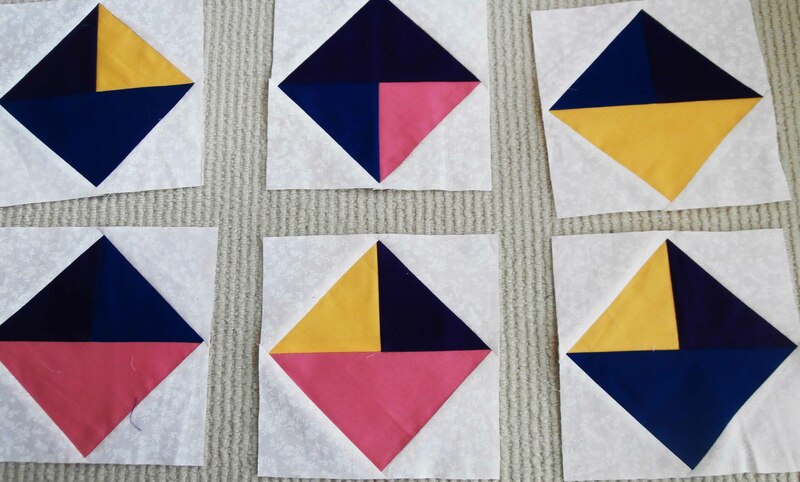 My name is Nicole and although I have been lurking, this is my first time putting blocks into the block lottery, even though I’ve been quilting for 20 years (made my first quilt when I was 20). I am very excited about the block lottery. The blocks was easy but it was a challenge to make each one different.. So in the end I made six blocks for the lottery and 12 for my quilt of all the blocks this year. The picture of my blocks is not that good. There is purple and blue in some of the blocks. Nice and bright, 7 and a quarter inches in size. If you want to see my other quilts they’re on my blog, “Quilting like a maniac” I’m currently doing 12 blocks of the month. Check them out. Thanks for the Block Lotto, it’s great!!! Love seeing so many others’ quilts and their beautiful designs! Good luck to all!